The popular and mature freemium app MediaMonkey was designed to manage and play back podcasts (i.e., "podcatch") as well as other audio formats. Doing so may require the use of iTunes if you can't find the RSS feed originally used by originator. 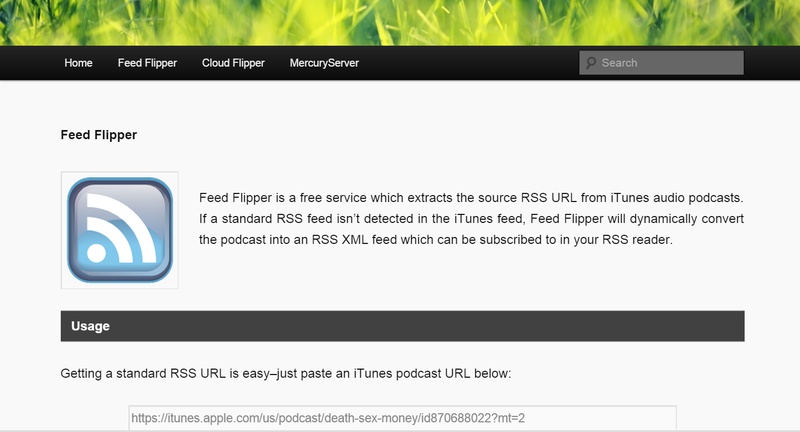 A free third party service called Feed Flipper will convert an iTunes URL to RSS so that MediMonkey can process it. This information was provided elsewhere, but without screenshots. As an infrequent iTunes user, I had some trouble finding the internal URL. 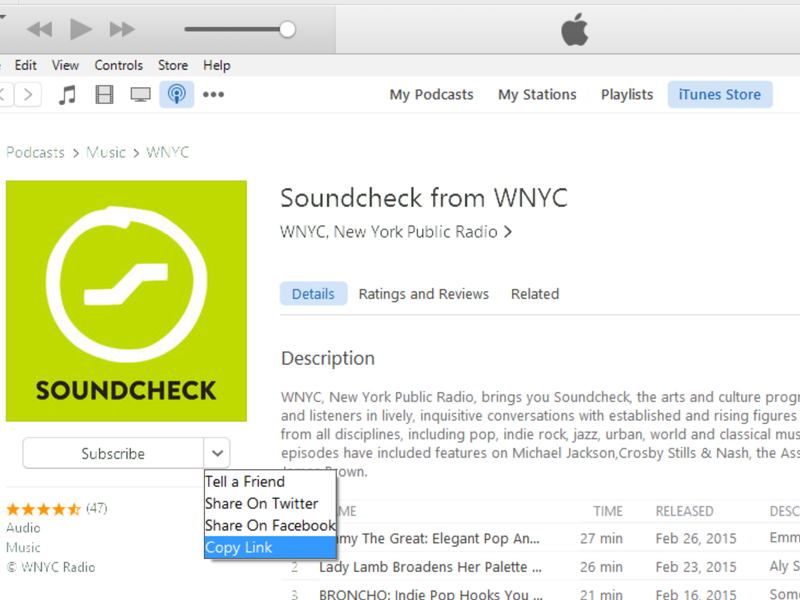 Here's the iTunes catalog page (my terminology) information provided for the WNYC podcast Soundcheck, hosted by John Schafer. A dropdown next to the Subscribe button discloses the URL for the podcast. Once you have the URL, ask Feed Flipper to do the conversion. 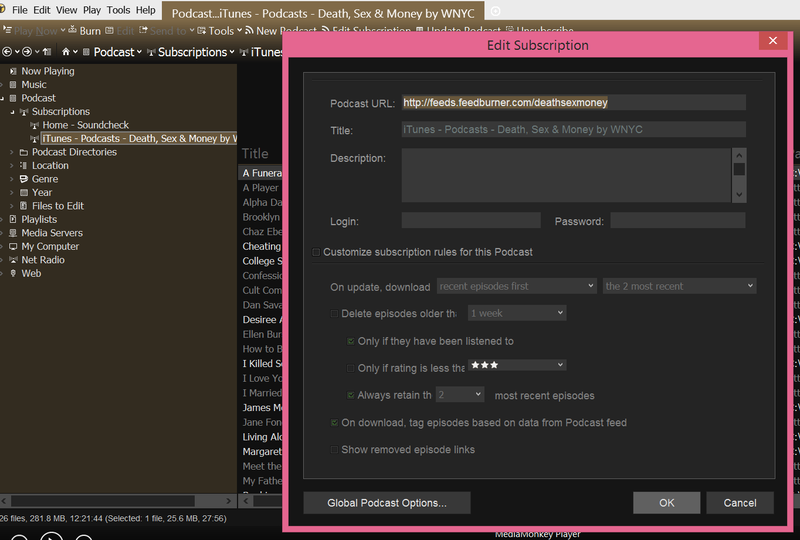 In MediaMonkey, adding the podcast URL is straightforward. Apple iTunes solves the problem of accessing podcasts across machines, but what if you want to do this with MediaMonkey? Stay tuned. There doesn't seem to be a clean solution for this, so it's likely a scripting kludge. MediaMonkey has an Android and a Windows Mobile client. Subscription sharing is also possible by exporting OPML feeds. Of late the internet connection over which this blog's content is created has received a lot of use. The cloud is playing a larger role, both from Office365, streaming audio, Netflix, Google Drive, and some of the computers on the network are synchronized to Drive. The download requirements are still primary, especially during the occasional Netflix "purchase," but uploads are increasingly important as the cloud assumes increased importance as a backup "device." It seemed like a good time to benchmark the reported network speeds -- sort of an integrity check on the attempted average speed provided by Verizon FiOS. 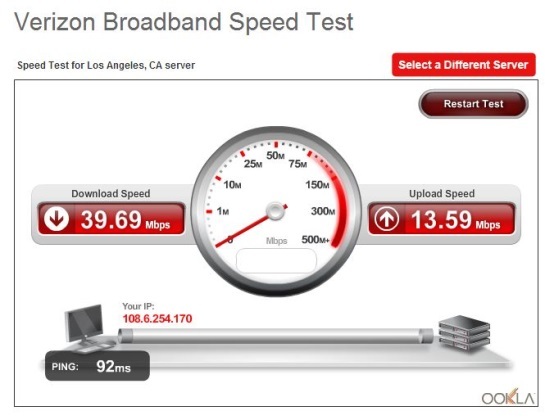 Verizon is promoting a 50/25 plan, but it appears that upload speeds would be even more adversely affected. 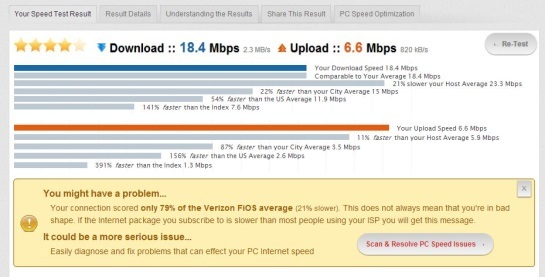 Verizon offers a speed optimizer that changes TCP/IP settings, but the effects of this tweak was not tested. 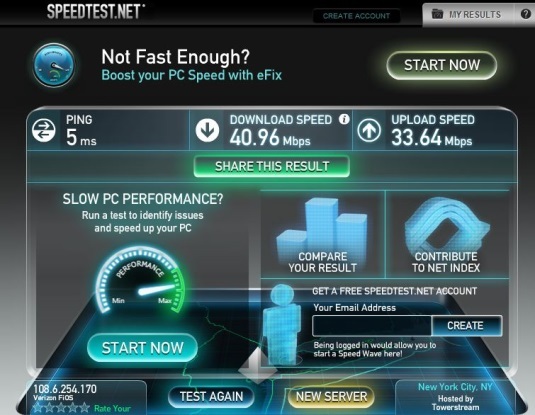 The FIOS connection described here has been recently updated and will be reported on in a post later in Fall 2014. 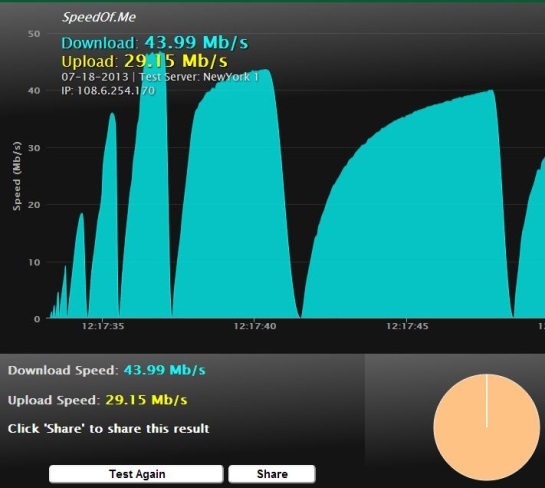 Test results from OOCLA (Verizon-hosted), using the Los Angeles server to our Greater Metro New York location. Lastly, here is the Speedof.Me benchmark result.